I was lucky enough to be sent this beautiful ring by Lushae Jewelry to review! Out of their gorgeous range, I chose the white gold Vintage promise ring - which is actually a set of two detatchable rings in one. One being a classic jewelled band, and the other is a Chanel-cut. 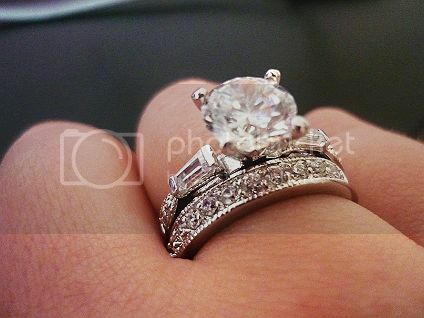 I absolutely adore sparkly rings, they just look so glamourous. I'm never going to be able to afford real diamonds (not on my current wage, anyway!) of this magnitude, they're a wonderful substitute which are shiny and glisten in the light. They have a lovely range of rings, pendants, bracelets, earrings in white and yellow gold, and they're very reasonable prices for how intricate the designs are. Stephanie from Buttons, Bows & Brogues was also sent a peice, and she chose this fabulous Vivienne Westwood-esque ring from the collection! Ooh! So be sure to check them out at JewelryArtDesigns.com. I'll be blogging about my London trip tomorrow (well, technically today! ), but I've been bedbound since coming home with a horrible stomach bug - so I'll be picking up the pace when I'm back to full health. I'm trying to get back on track for Sunday which is the A Night At The Musicals fundraiser at The Bank bar, to raise money for Northern Pride in Newcastle. If you're local, please consider coming down for a sing-song, and general campery with the drag queens. I can't wait! PS: Today, I also got an rejection letter for a writing job I applied to. It was for an American website, but they said they loved my work which is quite brilliant as I was up against qualified journalists - so I'm not too downheartened! Try, try again. love that ring and their cocktail rings!!! Wow! That ring is gorgeous!! I adore the cut of the large stone! Sorry about your rejection letter, don't give up! Elsa Weatherwax: Me too, it looks a lot more expensive than it is! OOO me loves. I really love rings but their hard to find in my size w/out the stretch band. "Your Receipt's In The Bag!" Outfit Of The Day: Arty. Red Hair: How-To and Upkeep! Outfit Post & Window Shopping! Another Illamasqua Convert! & Press!